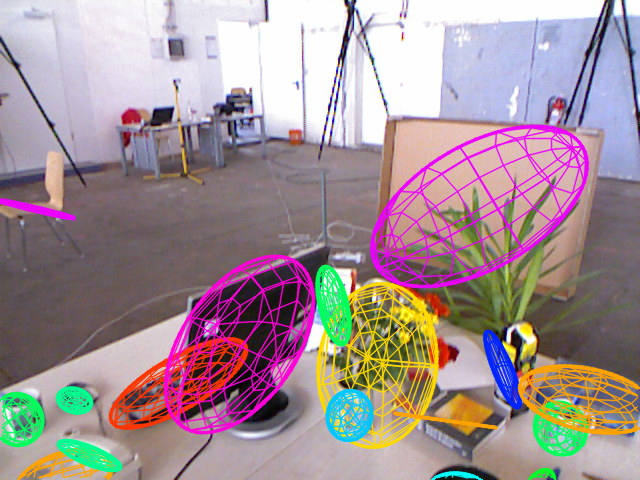 Current approaches to object-oriented SLAM (such as QuadricSLAM) lack the ability to incorporate prior knowledge of the scene geometry, such as the expected global orientation of objects. We overcome this limitation by proposing a geometric factor that constrains the global orientation of objects in the map, depending on the objects’ semantics. This new geometric factor is a first example of how semantics can inform and improve geometry in object-oriented SLAM. Comparing standalone QuadricSLAM (left) versus QuadricSLAM with both orientation factors proposed in this work (right). 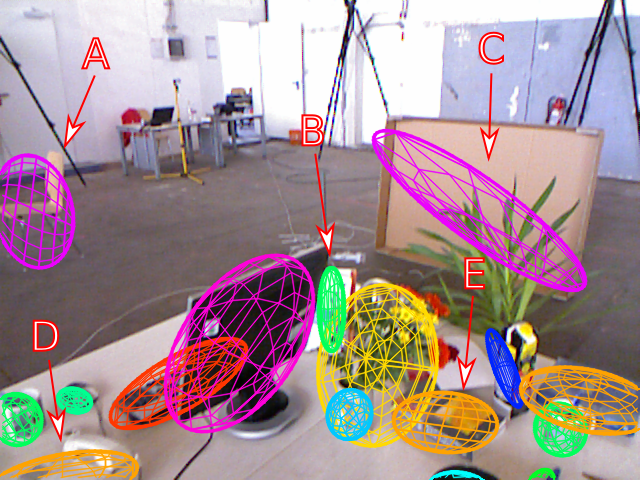 In this example our new factors visibly improve the estimated quadrics around the chair (A), bottle (B), phone (D) and book (E), resulting in a better alignment with the true objects. The cardboard box (C) was misclassified as a chair by the object detector (YOLO) which resulted in the wrong orientation factor being applied.